It's not the kind of language we're used to from world leaders, but Indonesia's president borrowed from comic books to deliver a lesson in economics. "Not since the great depression of the 1930s have trade wars erupted with the intensity that they have today. But rest assured, I and my fellow Avengers stand ready to defend Thanos from wiping out half of the population," he said. Thanos is a Marvel villain who wreaks havoc in a resource war. The playful language masked a serious point: economics is not a zero sum game of winners and losers, especially as the technologies of the Fourth Industrial Revolution create endless digital resources. Countries can trade and prosper together, as many leaders from the region underlined. Trade was high on the agenda throughout the meeting, with the world's two biggest economies, China and the United States, locked in a tariff war. Hu Chunhua, Vice Premier of the People's Republic of China, said: "We need to uphold openness and mutual benefits. Self-isolation will lead nowhere ... We must categorically reject protectionism and unilateralism." Japan's foreign minister, Taro Kono, expressed his support of the TPP trade pact and the hope that the United States would reverse course and eventually join. His South Korean counterpart, Kang Kyung-Wha, said she hoped her country would join "sooner rather than later." Myanmar's State Counsellor Daw Aung San Suu Kyi addressed the situation in Rakhine State, the arrest of two journalists and the transition of her country in an in-depth conversation with Børge Brende, President of the World Economic Forum. "There are of course ways in which we with hindsight might think the situation might have been handled better," she said. "We believe that for the sake of long term stability and security we have to be fair to all sides, that the rule of law must apply to everybody." One million Royingya people have fled to Bangladesh from Myanmar's troubled Rakhine state. Don't ask for money, don't do normal stuff, and look for the things that are magical, says Le Hong Minh, Co-Founder and CEO of Viet Nam's first tech unicorn, VNG group. Entrepreneurship was a big focus this week for a region with a booming young population and a start-up scene that includes 10 unicorns - companies with a valuation of over $1 billion. The World Economic Forum also welcomed 80 winning start-ups as part of a competition to find the region's most dynamic new companies. Ahead of a third meeting this year between the leaders of North and South Korea, the southern foreign minister Kang Kyung-Wha spoke of an unprecedented opportunity for relations between the two hostile nations. "For three decades, North Korea’s nuclear and missile programme evolved to be a serious and the greatest threat. But now, through extensive diplomatic endeavours ... over the past year we have a very real chance to achieve North Korea’s complete de-nuclearisation and establish lasting peace on the peninsula," she said in the opening plenary. At 25, he's Malaysia's youngest ever minister. Syed Saddiq was due to go to Oxford University for a Masters in Public Policy, but he turned that opportunity down to pursue a career in politics. He told an audience of students to disrupt, not adapt, and in an interview said the young generation wanted a more tolerant, inclusive future for Malaysia. 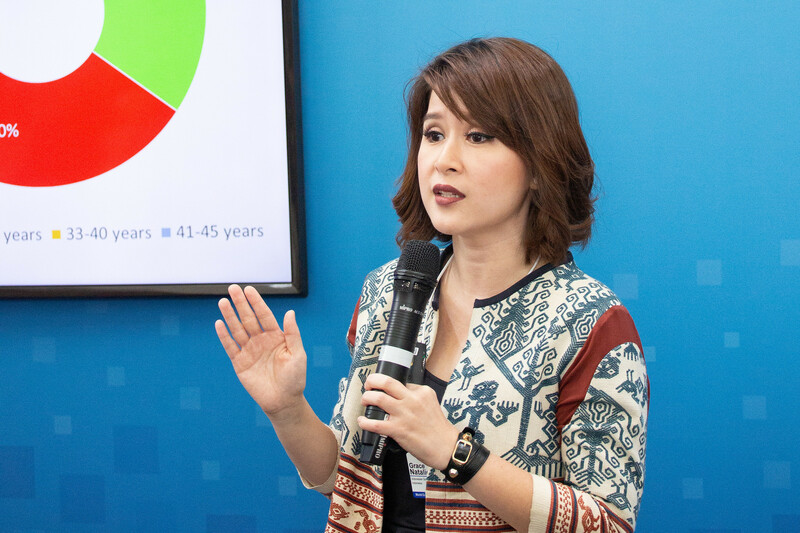 Other young movers and shakers on the political scene at the summit included Grace Natalie, pictured, co-founder of the Indonesian Solidarity Party, dubbed the "millennials' party"; and Thailand's Thanathorn Juangroongruangkit, founder of the Future Forward Party. Read more highlights from the World Economic Forum on ASEAN here, or catch up with events as they happened in our liveblog.